We all know about the cliché of the 3-minute pop song – 3 minutes being long enough to tell a decent story in a verse-chorus-verse format, but not so long that our attentions wander and we change the channel on our kitchen radios. Interestingly, the peak in length distribution of my song collection actually occurs at 3:02. I have 155 tracks clocking in at 3 minutes and 2 seconds, but only 127 that are exactly 3 minutes long. But what’s additionally interesting is the demographic of this 3:02 crowd – pop song length is not confined to pop songs. So as well as the usual crowd of indie rock classics, blues legends and easy listening pieces, we’ve got contributions from Russell Haswell, Alvin Lucier, AMM, CM von Hausswolff, Swans, Miles Davis, Thelonius Monk, Taku Sugimoto, Tod Dockstader, Hecker, Rehberg & Bauer, David Toop & Max Eastley and Annette Krebs & Andrew Neumann, none of whom are normally known for their chart-topping singles. This perhaps suggests a fundamental human attention span for optimum listening. – 155 x 3:02 long tracks is 7 hours, 50 minutes and 10 seconds of non-stop music. What an awesome party that would be. – There’s an interesting little cluster at the 10 minute mark. I suppose this is a result of the double figure of ’10’ being a psychological landmark for musicians – where no obvious verse-chorus-verse structure dictates the end of a song, it seems more worthy to fade out to give a nice big round number than a lowly, inadequate single figure. – Other little peaks appear above the best-fit curve at other integer values – notably 1 (not shown here, because at 337 tracks it goes off the scale – largely a result of Fällt’s invalidObject series), then 2, 4, 5, 7, 12, but not really 6 or 9 (if you’re going to write a 9 minute drone, might as well stretch it out to last 10, eh?). Again, I’m thinking this is purely psychological. There’s something satisfyingly tidy about round numbers, and given the unstructured nature of lots of my music collection, precise timings are somewhat arbitrary. – I made similar charts ages ago, back when I only had around 14,000 and 30,000 tracks in the library, and the overall shape of the distribution curve was very similar. 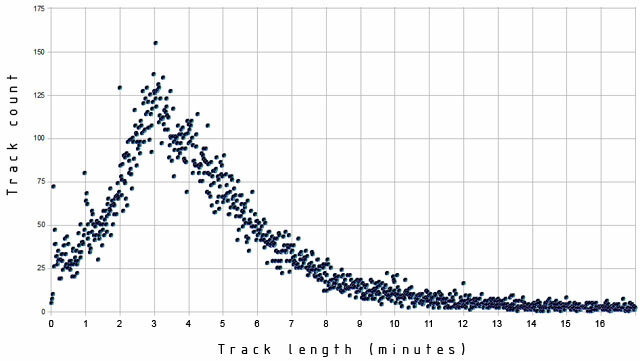 At 14,000 tracks, the most common time was 3:06, but with 30,000 it was 3:00 exactly. – Most interesting of all: the lengths I’ll go to to avoid doing any proper work.